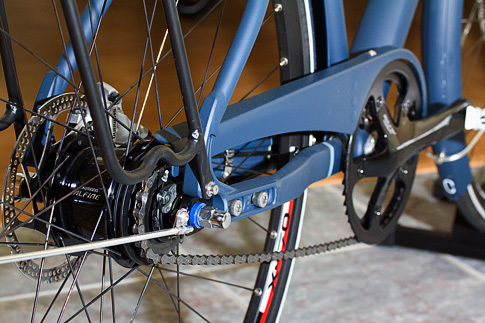 3 speed internal geared hub, 42t front and 16t rear gearing. What does the latter spec (42t/16t) describe? You have to have a chainring in the front attached to the crank and a cog on the back attached to the internal gear hub to use an internal gear hub (IGH) (and the chain goes between the chainring and cog, as on a usual single speed bike). (Looks just like a single speed from the outside with a 42t in the front and 16t in the back in the case of the bike you're looking at). In this case, the chainring is 42t and the cog in the back attached to the internal gear hub is 16t. This choice of chainring and cog determines the gearing achievable by the internal gear hub. Roughly speaking, when in the middle of the 3 speeds, your gearing will be determined by the 42/16 combination. Then, the low will drop it around 25% from that while the high will increase it around 33% from that (typically; the numbers may vary for your particular model). I'd recommend looking at this page by Sheldon for more details on how IGH's work and related things. Not the answer you're looking for? Browse other questions tagged internally-geared-hub terminology or ask your own question. Is it possible to use road-style brifters with an internal gear hub? Half speed internal hub gear? Are torpedo 3 gear shift cables a standard or are there different sizes?